FSFlow is a Social Engineering Call Flow Application, which was created to improve and standardize social engineering calls. It’s a difficult thing to do, conversations can go almost anywhere over the span of a phone call which makes defining a specific process hard, if not impossible. FSFlow is mostly a proof of concept tool but it’s fully functional, it’s an interesting tool and an area which not many people have thought about or looked into. Social Engineering is part science and part art (charisma and charm helps a lot), so a tool like this helps a lot especially in creating repeatable social engineering tests. It’s based on the concept of the call flow software that is involved in most telemarketer jobs. Nearly everything that they say is presented to them on a screen in front of them, and they would navigate through a process flow as the call progressed. One of the major pains with designing an application like this is judging the response of a user. You can never predict the user’s exact response so the measure of the response needs to be somewhat abstracted. The approach here is to identify if the user’s response is positive or negative. For instance, if you say “Hi, How are you?” and they say “Great!” – that’s a clearly positive response, while “What do you want.” is a bit more negative. Similarly, if you ask someone “What is your password?” and they provide it to you, that would be positive, while anything else is likely to be negative. The difficult thing here is that many user responses aren’t easily categorized as negative or positive; perhaps a sliding scale would be more appropriate – but that would create tons of possible branches, making a complete call flow impractical. Another hugely important part of FSFlow is to capture how the call progressed. The call log records how the call progresses and what information is obtained at what points in the call flow. You could potentially use this information to determine where users need more security awareness training – e.g. every user was willing to disclose their IP address, but only some gave their password or even when asking this specific question, users got suspicious and ended the call. FSFlow’s interface is meant to be as simple and straightforward as possible so that the caller is not overwhelmed or distracted during the call. Statement Pane – The statement pane is the actual wording the caller says during the call. This is your social engineering attack. The important thing about this pane is that the wording is clear and easy to read aloud. You’ll notice in the screenshot above that there are placeholders, e.g. “[TARGETNAME]”, this are call specific variables that are populated once you populate the Call Variables pane (described below). Objectives – The Objectives pane is where the caller can log what elements of information they’re able to obtain during the call. 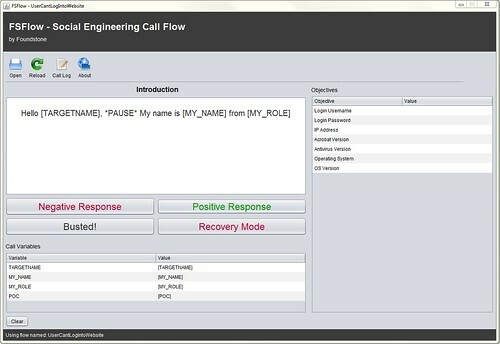 Call Variables – Call Variables customize the flow to each individual call. Before the call starts, the caller populates these variables so that the placeholders in the statement pane are replaced with pertinent information. It also serves as a reminder to the caller to who they are pretending to be! Thee most important component of FSFlow is its XML based call flows. The idea behind the call flow is that they could be easily shared to be improved and make standardized attacks. Let’s look at sample.xml that’s included with the application. The entire call flow is included within a block which takes one attribute, name. Within the CallFlow block, you have Objective, CallBlock, and FlowBlocks. A CallBlock is effectively a container for an individual statement. These statements are then linked together within the FlowBlock below. Place holders can be anything you’d like, as long as they’re wrapped in brackets. FSFlow analyzes the flow on start up to populate the “Call Variables” pane. Evil Foca is a network attack toolkit for penetration testing professionals and security auditors whose purpose it is to test security in IPv4 and IPv6 data networks. Each is explained more in depth in the following section. DoS attack in IPv4 with ARP Spoofing: This type of DoS attack consists in associating a nonexistent MAC address in a victim’s ARP table. This results in rendering the machine whose ARP table has been modified incapable of connecting to the IP address associated to the nonexistent MAC. So the recent XcodeGhost iOS Trojan Infection has escalated quickly, an initial estimate of 39 infected apps has rapidly increased to over 4000! 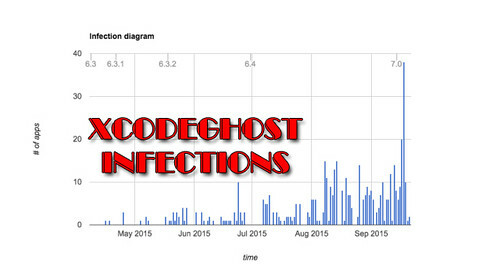 The number of XCodeGhost-infected iOS apps, initially pegged at 39, has ballooned to more than 4,000. The staggering increase was the handiwork of analysis by FireEye researchers who said that the apps were being hosted on the official Apple App Store. “Immediately after learning of XcodeGhost, FireEye Labs identified more than 4,000 infected apps on the App Store,” FireEye said. The malicious apps steal device and user information and send stolen data to a command and control (CnC) server [and] also accept remote commands including the ability to open URLs sent by the CnC server. These URLs can be phishing webpages for stealing credentials, or a link to an enterprise-signed malicious app that can be installed on non-jailbroken devices. A FireEye spokesman told Vulture South that many of the infected apps were owned by “big Chinese global brands” such as consumer electronics, telcos, and banks. The Register has asked FireEye for the names of some of the prominent affected apps and will update this story should the information come to hand. FireEye put the huge increase in the number of discovered apps to fast scanning by its mobile threat prevention platform. A translation using Google sees the author apologise and say he wrote this as a personal experiment and the original only collects non-personal data like device type, iOS version, language, country, device name and so on. Apple has continued to exorcise the App Store of malicious apps uploaded in what has been widely considered to be Cupertino’s first big malware attack. The apps were infected after developers downloaded a copy of the Xcode iOS development tool through a file-sharing service. That package was modified to trojanise apps in a way that passed App Store security checks, and was advertised on popular developer forums as a faster source to download the 3Gb Xcode file. The success of the XCodeGhost phish is staggering; that some 4,000 apps were hosed indicates that a lot of developers were sucked into what must have been a very well-executed attack by highly capable malefactors. Veracode principal solutions architect John Smith said that the attack challenged the notion that iOS was safer than Android. “In recent years it has seemed that the problem of mobile malware was bigger for Android than for iOS,” Smith said. From an infection graph, it seems like it’s been going on for a while, since April 2015 at least – but there’s been a huge peak in infected apps in September. It’s surprising that such a large number of apps were able to violate Apple’s stringent App Store policies for such an extended period of time. Even then, it seems like the implementation of XcodeGhost isn’t that malicious and they aren’t sending much more than the original author intended. The peinjector is a MITM PE file injector, the tool provides different ways to infect Windows platform executable files (PE COFF) with custom payloads without changing the original functionality. It creates patches, which are then applied seamlessly during file transfer. It is very performant, lightweight, modular and can be operated on embedded hardware. Full x86 and x64 PE file support. Fully working on Windows and Linux, including automated installation scripts. Can be operated on embedded hardware, tested on a Raspberry Pi 2. On Linux, all servers will be automatically integrated as service, no manual configuration required. Plain C, no external libraries required (peinjector). MITM integration is available in C, Python and Java. A sample Python MITM implementation is included. Foolproof, mobile-ready web interface. Anyone who can configure a home router can configure the injector server. Easy to use integrated shellcode factory, including reverse shells, or meterpreter. libpefile – Provides PE file parsing, modification and reassembling capabilities, based on PE COFF specification. Also works with many non-compliant and deliberately malformed files which the Windows Loader accepts. libpetool – Provides more complex modifications (adding/resizing sections). Keeps header values PE COFF compliant. libpeinfect – Provides different infection methods, removes integrity checks, certificates, etc. It can fully infect a file (statically, e.g. from disk) or generate a patch (for MITM infection. Connectors which work with these patches are available in C, Python and Java). The infected file keeps its original functionality. peinjector – Provides PE file patching as a service. Just send the raw header of your PE file and you’ll receive a custom-made patch for it. Can be remotely controlled via a command protocol. 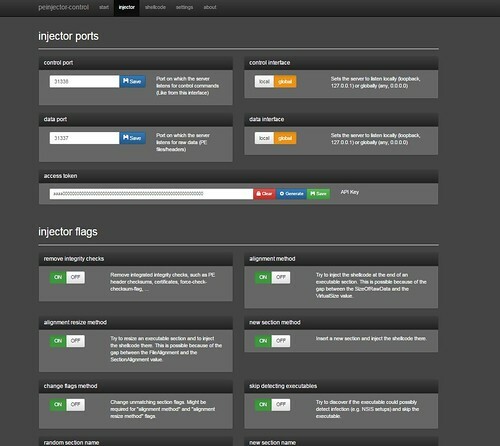 peinjector-control – Web interface to configure and control a peinjector server. A small shellcode factory with some basic shellcodes, automatic encryptoin/obfuscation and thread generation is provided – alternatively, custom shellcode can be injected. peinjector-interceptor – Sample MITM integration. Based on Python and libmproxy, supports SSL interception, can act as transparent Proxy, HTTP Proxy, … . Provides seamless PE patching capabilities. 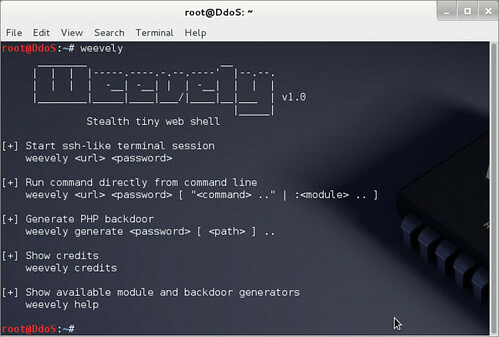 Weevely is a command line weaponized PHP web shell dynamically extended over the network at runtime and is designed for remote administration and pen testing. It provides a telnet-like console through a PHP script running on the target, even in restricted environments. The low footprint agent and over 30 modules shape an extensible framework to administrate, conduct a pen-test, post-exploit, and audit remote web accesses in order to escalate privileges and pivot deeper in the internal networks. The remote agent is a very low footprint PHP script that receives dynamically injected code from the client, extending the client functionalities over the network at run-time. The agent code is polymorphic and hardly detectable by AV and HIDS. The communication is covered and obfuscated within the HTTP protocol using steganographic techniques. Weevely also provides python API which can be used to develop your own module to implement internal audit, account enumerator, sensitive data scraper, network scanner, make the modules work as a HTTP or SQL client and do a whole lot of other cool stuff. 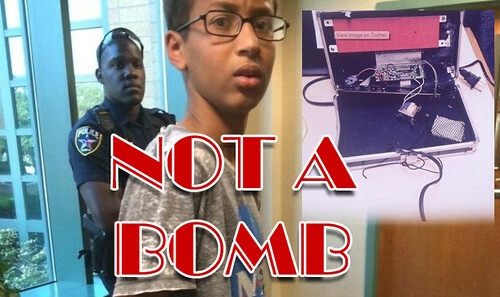 So, today we have a tale of the fabled American knee-jerk reaction, kid arrested for clock he built – this time to a 14-year-old Muslim boy who made a cool clock and brought it to school. He got arrested, cuffed and fingerprinted – over a science project. Yah, arrested for building a clock. That seems like a slightly harsh reaction, perhaps because his name is Ahmed? Or he’s Muslim? Or 9/11 was just a few days ago? Or all of the factors combined, and the fact his clock bleeped in class. The coolest part? He was arrested wearing a NASA t-shirt. Texas police have decided not to charge a 14-year-old Muslim boy who was arrested for bringing a homemade clock to school. Ahmed Mohamed’s arrest has been sharply criticised, and the boy has received an outpouring of support including an invitation to the White House. Ahmed’s family believes he was detained because of his name. The boy was placed in handcuffs and fingerprinted. He was released after it was determined there was no threat. Zuck posted his support for Ahmed too. It’s turned into quite something with POTUS, Hilary Clinton, the US Secretary of Education and many many more getting involved. Under the hashtag “#IstandwithAhmed,” thousands of Twitter users praised the boy’s initiative and questioned why he was detained including Nasa scientists and US President Barack Obama. “Cool clock, Ahmed. Want to bring it to the White House? We should inspire more kids like you to like science. It’s what makes America great,” Mr Obama wrote on Twitter. Ahmed said that he had made a clock at home and brought it to school to show his engineering teacher. He said his engineering teacher had congratulated him but advised him “not to show any other teachers”. Check out the Tweet from POTUS, he’s not impressed with the kid arrested for clock scenario. It’s all getting very intense.